Last Week in Review: There was key news on housing, jobs, and retail sales. Forecast for the Week: The economic calendar is filled with important reports on housing, inflation, and manufacturing. Plus the minutes from the Fed's latest meeting will be released. View: There's a new phone scam to be aware of. Save yourself time and aggravation by reading the information below. "The important thing in this world is not so much where we stand, as in what direction we are moving." Oliver Wendell Holmes. With several disappointing economic reports of late, the question remains whether our economy is moving in the right direction. 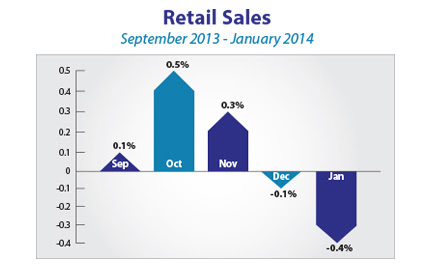 There was a disappointing read on January's retail sales, as they fell by 0.4 percent versus the 0.0 percent expected. This was the second straight monthly decline and retailers cited the harsh January weather as the reason.There was also some disappointing news in the labor market, as weekly Initial Jobless Claims rose by 8,000 in the latest week to 339,000. In addition, the four-week average, which irons out seasonal abnormalities, also increased. The labor market has been muddling along for the past two months, especially given December's and January's weaker than expected job creations.There was some good news on the housing front, as RealtyTac reported that January marked the fortieth consecutive month where U.S. foreclosure activity declined on an annual basis. Filings are down 18 percent from January 2013 to January 2014, but the annual decline of 18 percent was the smallest annual decline since September 2012. What does this mean for home loan rates? Remember that the Fed is now purchasing $35 billion in Treasuries and $30 billion in Mortgage Bonds (the type of Bonds on which home loan rates are based) to help stimulate the economy and housing market. This figure is down from the $85 billion in Bonds and Treasuries the Fed had been purchasing last year. If economic reports continue to be weak, the Fed will have to decide whether it will continue to taper its Bond purchases. This will surely have an impact on the markets and home loan rates in the weeks and months to come. The markets are closed Monday for the Presidents Day holiday. The rest of the week will be busy, with key housing, inflation, and manufacturing news. Manufacturing data from the Empire State Index on Tuesday and the Philadelphia Fed Index on Thursday will give investors a look at two of the major regions in the nation. Housing dominates the week with the National Association of Home Builders Housing Market Index on Tuesday, Housing Starts and Building Permits on Wednesday, and Existing Home Sales on Friday. We'll get a read on inflation with the wholesale-measuring Producer Price Index on Wednesday, followed by the Consumer Price Index on Thursday. Also on Thursday, Weekly Initial Jobless Claims will be reported as usual. In addition, the minutes from the January 28-29 Federal Open Market Committee meeting will be released on Wednesday, and this could provide some volatility this week. Investors will be looking for additional information about tapering when the minutes are released. Will the minutes hint toward ending the Fed's Bond purchase program sooner rather than later? To go one step further a red "candle" means that MBS worsened during the day, while a green "candle" means MBS improved during the day. Depending on how dramatic the changes were on any given day, this can cause rate changes throughout the day, as well as on the rate sheets we start with each morning. 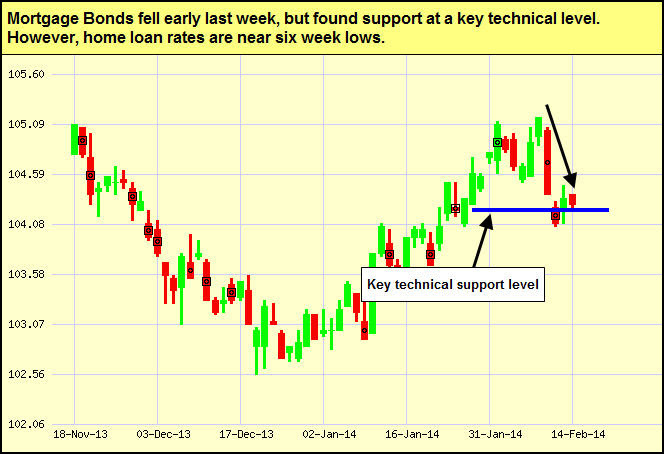 As you can see in the chart below, it was a volatile week for Bonds, but home loan rates are still attractive. I'll be watching the markets closely for all the latest developments. By Cameron Huddleston, Kiplinger.comThe next time you miss a call and don't recognize the number on your caller ID, don't return the call because it could be a scam.Scammers are using auto-dialers to call cell-phone numbers nationwide, let the phone ring once and then hang up, according to the Better Business Bureau and Federal Trade Commission. Those who call back are connected to a paid international adult entertainment service, chat line or other premium service that charges a $19.95 international call fee and per-minute fees that are $9 or more, according to the BBB.These "one-ring" scam calls appear to come from within the U.S. but typically originate from the Caribbean, according to the FTC. Area codes on the calls are frequently 268, 284, 473, 664, 649, 767, 809, 829, 849 and 876.Both the BBB and FTC are urging consumers not to answer or return calls from numbers they don't recognize to avoid becoming victims of this one-ring scam. The agencies also recommend checking your mobile phone bill carefully and alerting your carrier if you see any unauthorized charges. The sooner you catch and report fraud, the better your chances of having the charges removed, according to the BBB. If you're unable to resolve the issue with your carrier, file a complaint with the Federal Trade Commission and Federal Communications Commission. Reprinted with permission. All Contents 2014 The Kiplinger Washington Editors.